Recycle Link Wales is set up to bring all those connected to Wales' recycling industry together. Its aim is to share and provide updates on news and issues affecting Wales' Recycling industry including Policy, Jobs, Events and Tender opportunities. Recycle Link Wales is aimed to bring together a network of individuals and business who are connected to the Welsh recycling industry. It is hoped that through this network a strong representation group will be formed so that all sections of the industry can communicate and work better together in order to promote business opportunities, increase knowledge and build on the great effort that the Welsh recycling industry as a whole is contributing. Having worked within the Public and Private Sectors of the Welsh recycling industry for over a decade, my passion for both Wales and for the recycling industry in which I work has led me to create 'Recycle Link Wales' in order to share news and features. It is my aim to create a strong group of representatives from across the recycling spectrum services to facilitate and provide a forum to better communicate together and with policy makers in Wales. It is my hope that Recycle Link Wales will be a tool and a resource to aid the continual progression of recycling in Wales. 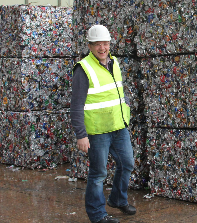 This is an independently run and funded site created to allow those interested to gain direct and instant access to news and opportunities within the recycling industry in Wales. I hope Recycle Link Wales will benefit those working in Wales' recycling industry and those wanting to connect to it.